Western Pennsylvania has set the standard for quarterback excellence. It has been distinguished as the “Cradle of Quarterbacks” for producing such names as Joe Namath, Joe Montana, Jim Kelly, and Dan Marino. The gunslinger who pioneered the movement, Johnny Unitas, led a storied career of sheer dominance with an arm that put the NFL on the map. We remember his greatness fifteen years following his passing. It all began in the neighborhood of Brookline where his father, Leon, was the owner of a coal-delivery business. He died when Johnny was just five years old, prompting his mother, Helen to take over the establishment. Unitas had his sights on becoming a professional quarterback from an early age. He exhibited an aptitude for the game while attending St. Justin’s High School. 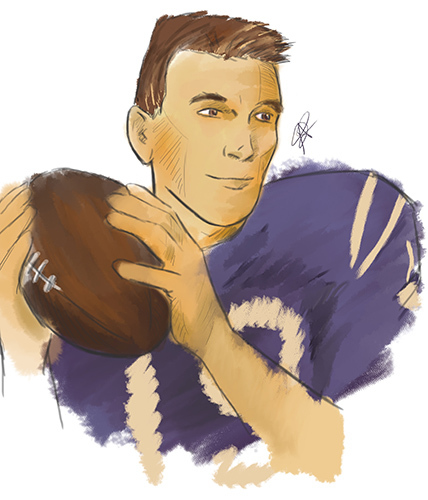 Recognized as a member of the Pittsburgh All-Catholic team, Unitas was beginning to be renowned for his talents. He took a liking to the University of Notre Dame in his pursuit of finding a home for the next four years, but he was ultimately rejected due to his scrawny physique. As a result, the University of Louisville welcomed Unitas and he entered the next stage of his career draped in red, as a Cardinal. Setbacks continued to hit the young quarterback as his senior year was spoiled by injuries. As a result, many teams overlooked him in the 1955 NFL Draft. But, Unitas would ultimately have his name called in the ninth round by the Pittsburgh Steelers where he was given an opportunity to play professionally for his hometown. Unitas would face rejection again, as a quarterback dilemma emerged in Pittsburgh and three spots were to be filled. Walt Kiesling, the Steelers head coach at the time, alleged that Unitas lacked intelligence to be an NFL quarterback. Cut, he would never play a single down for the black and gold. His career looked bleak as he wound up playing semi-pro ball for the Bloomfield Rams. His story wasn’t quite over just yet. Unitas scored a tryout with the Baltimore Colts and landed a spot as a backup quarterback to starter, George Shaw. He was in uniform for the 1956-1957 season and saw his first action in the NFL. His initial starts did not mirror his future success, but he solidified his spot as a competent starting quarterback. The following year turned around the entire franchise by giving the Colts their first winning season and championship, while earning Unitas the Most Valuable Player Award for his efforts. Perhaps, his crowning achievement was at a hallowed place where men in pinstripes dominated the game of baseball. Yes, it was Yankee Stadium that housed the 1958 NFL Championship against the New York Giants. A contest that many claim as the “Greatest Game Ever Played”. Being the first nationally televised football game, 45 million captivated fans watched as Unitas marched down the field in the latter half of the fourth quarter from his own 14-yard line. A field goal would send it into sudden death overtime With the score knotted at 17, the Colts halted the Giants after they won the coin toss and began an 80 yard drive of their own. The thriller ended in Unitas handing it off to fullback, Alan Ameche, where he tumbled in the end zone to seal the Colts’ first title while ultimately increasing popularity in American football. Unitas went on to acquire many honors throughout the rest of his career. He helped deliver an NFL Championship the following year, to go along with his MVP award. As the game progressed with the merger of the AFL and the NFL, football introduced what would become one of the biggest events on the American calendar–the Super Bowl. Unitas would play off the bench in Super Bowl III against fellow Pittsburgher, Joe Namath, but the Colts were not victorious. Baltimore seized another opportunity for the Lombardi Trophy in 1971. Unitas and the Colts would face-off against “America’s team”, the Dallas Cowboys in Super Bowl V. After suffering a rib injury, Unitas would leave the field and not return for the remainder of the game. However, the Colts would win despite Unitas’ absence. The unexpected hero, Jim O’Brien, kicked a go-ahead field goal with only seconds left in regulation time. Nonetheless, Johnny Unitas was a Super Bowl champion. He would complete his career in 1973 as a member of the San Diego Chargers. He revolutionized the game of football. Unitas was an icon, the image of the American dream, a man from Pittsburgh, Pennsylvania who became a national football star. Even though his career was not enshrined in the black and gold, Unitas carried a spirit and charisma that can only be attributed to a city of champions.